Hanno and I quietly celebrated our 37th wedding anniversary this week. :- ) I can't say we've always been in sync, but in our older years we walk to the beat of the same drum. I'm looking forward to another weekend sleepover with Jamie and Alex. They'll have a campfire in the backyard with their favourite sausage on bread dinner, followed by hot chocolates and marshmallows. It will be the last time they'll both here when there is no little Scottie dog in the backyard. 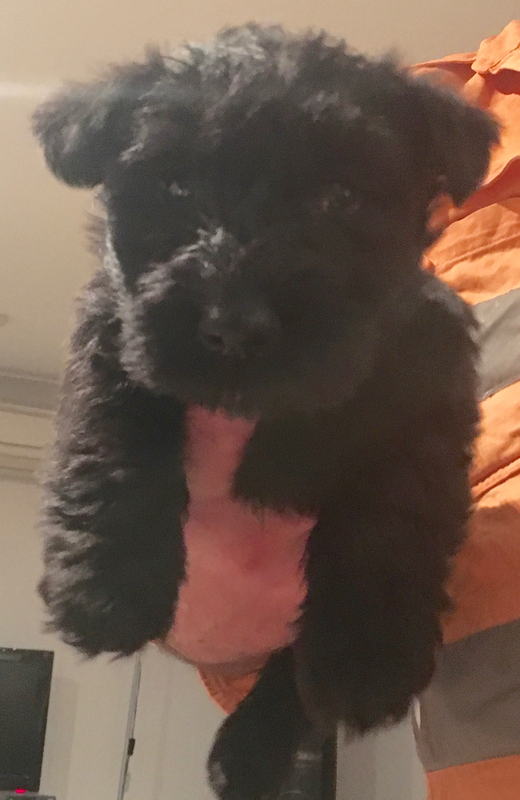 Gracie arrives next Wednesday and we're all very excited. Thanks for your visits and comments this week. I hope you have a wonderful weekend at your place too. Planes need to stop existing in a parallel universe when it comes to the climate fight This was a topic of discussion on the forum this week. I believe it will be one of the big issues in years to come. It should be a big issue now but no one seems to want to tackle it. I think Hanno and I have been pretty succesful in changing our lives from one of stress, expense and disorder, to a life of relaxed contentment, getting value for money, routines and organisation. It wasn't easy at the start, mainly because I didn't know then what I was looking for, but now it's just how we are. A lot of people ask me about how we settled into this way of life, how we paid off our debt and how we maintain a lifestyle that gives us so much. The hardest thing is changing how you think about success and what you believe you're entitled to. If you continue to believe you should have everything your friends have, if you always reward yourself for doing the hard yards or if you can't get your spending under control, you'll struggle to live simply. On a more general level it's got a bit to do with self-control, moderation, prudence and cutting back where you can. You work to use less of everything - less electricity and water, fewer products, less waste and packaging. I'd also add less travelling and only essential flying, although very few people seem to agree with me on that. For me, it's in my top ten. 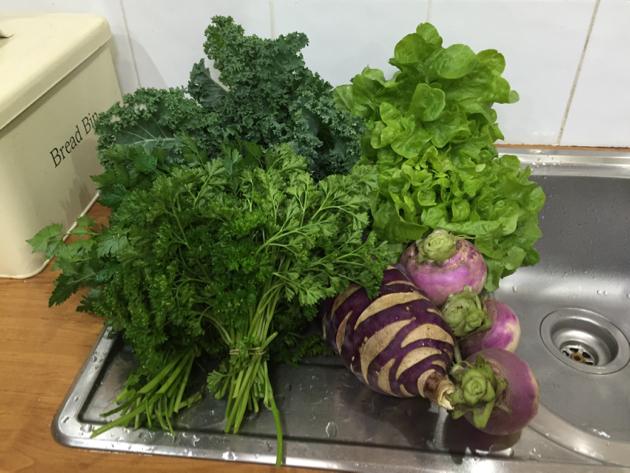 If you have the time, grow some of your own food. 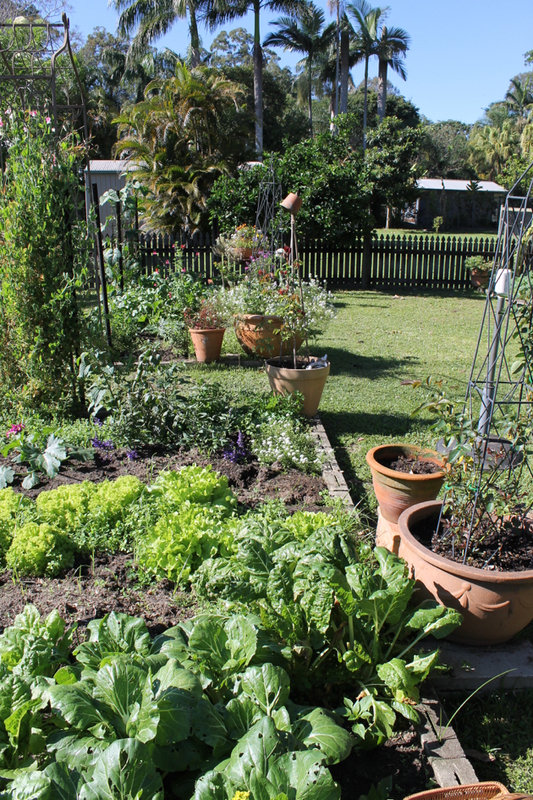 If you can't grow a lot of food, grow herbs and fruit. They don't take a lot of time and they'll save you money. Giving up buying everything you want is difficult because not only do you give it up today, you're giving it up over and over again for years. You're always cutting back and looking for ways to use less. You will get used to that but it's tough when you start. We've lived this way for many years and now cutting back is more about getting value for money instead of buying the cheapest of everything. I look at my budget as a whole instead of individual prices and if I can buy everything I need with my budget, I'm happy. That might mean a bit of juggling some weeks - I might not buy something so I can afford fish or a better cut of meat, or it could mean living off the stockpile for a couple of weeks so we have the food money for something else. We know what we can afford and stick to our budget, but when it's needed, a bit of juggling helps us to always stay within budget while having all we need. And that is a choice for us. Look for value for money instead of penny pinching. If you don't have enough to pay your monthly bills, cut out unnecessary expenses like mobile phone, cable TV, magazines, coffee at the cafe, bottled water and drinks etc. Turn off stand-by appliances when you're not using them and when you go to bed. Stop buying cleaning products and make your own using soap, bicarb, vinegar, washing soda and borax. Check out your local butcher shop. The prices will probably be lower than the supermarkets and the quality of meat better. 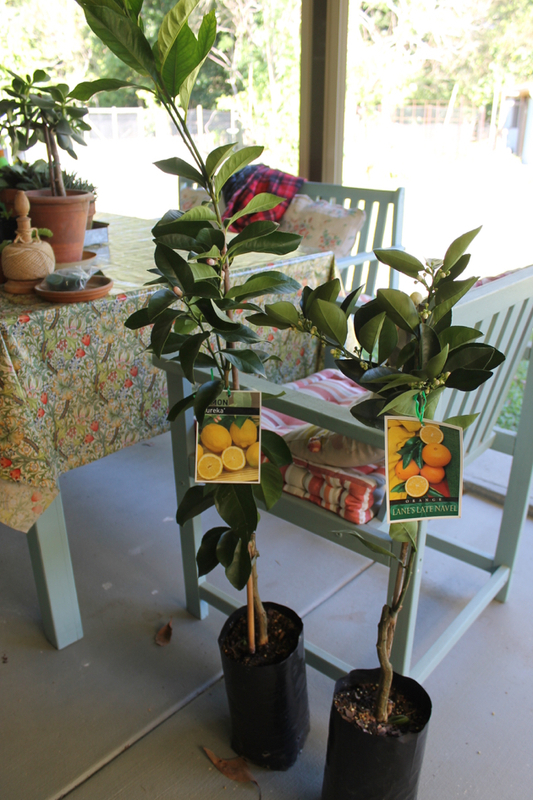 Try bulk buying with a friend to see if it works for you. Teach yourself to knit and sew. There are many sites on the internet with very good instructions, tutorials and sometimes, videos. Be content with what you have. If you're tempted to buy something you can't afford, think about how you'll worry when you can't pay your bills and how that stress will affect you. If you've already got a garden, think about adding a few chickens. Make do with what you've already got. Repurpose and recycle. Focusing on budgets, buying and growing food, cooking, baking, cleaning, all contribute to how you feel each day. Setting targets for yourself and reaching those targets gives you a feeling of control and achievement. It may not be how other people live, it may require juggling, but you'll slow down, live how you want to live and regain some balance in your life. At the beginning, not every day will be good but the certainty of your chosen path will keep you going until things improve. Take small steps towards your new life, be proud of each achievement and you'll slowly create a different sort of life. It won't be the same as the way I live, it will be your unique work in progress, a life that you've pieced together knowing what you need to thrive so you can live the way you choose. I've been fairly busy this past week with Jamie, Hanno's birthday and getting ready for Gracie. The weather here is great at the moment. It's neither hot nor cold and the afternoons are the best they've been all year. This perfect time will be over in a flash though because after the equinox, the days will get longer, the mildness of the weather will change to constant warmth and, once again, the seasons will change. Have a wonderful weekend, friends. I'll see you next week. I have a bit of a chuckle now and then about the food police and how they try to shame or scare parents into serving this or that. Usually they insist you try "new" food that has been around for donkey's years but is "new" to the person writing the article. I've been through parenthood when I gave my sons what I believed was a good selection of balanced meals. They were the foods my family have eaten for generations. During that time I discovered that like us, children have genuine likes and dislikes and forcing them to eat something they don't like is usually counter-productive. That doesn't mean I let them choose their own food. They ate what we ate as a family. If they didn't like it, they had fruit or they went without. I never made different meals for certain members of my family and I am grateful we didn't have food allergies or illness that made some foods a problem. Homemade meat pie with eight vegetables. Now I'm a grandma and have the responsibility of feeding my grandchildren when they're with us. 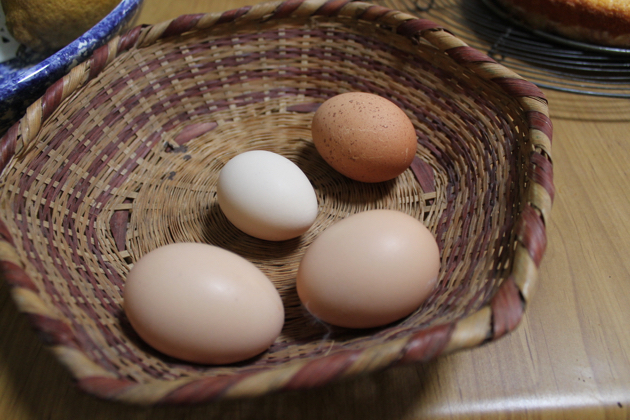 I feel that responsibility because I want to blend in with what I know they're being fed at home, but I also want to give them the foods we eat and a small treat every now and then. I hope I get it right more than I get it wrong. Jamie is here with us during the school holidays and while he eats what we eat with very few complaints, I like to give him food that I know he enjoys as well. 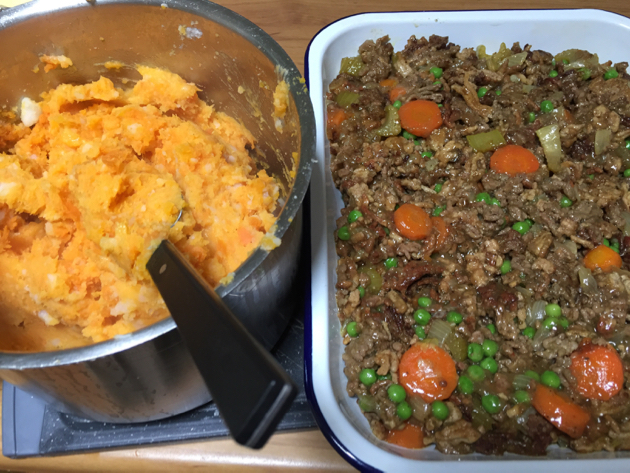 Yesterday I made a meat pie with vegetables - even sweet potato that I know he doesn't like. He loved it. He had a dollop of tomato sauce and he consumed almost twice as many vegetables as the recommended daily amount. I could easily have included 10 vegetables but decided to stop at eight. 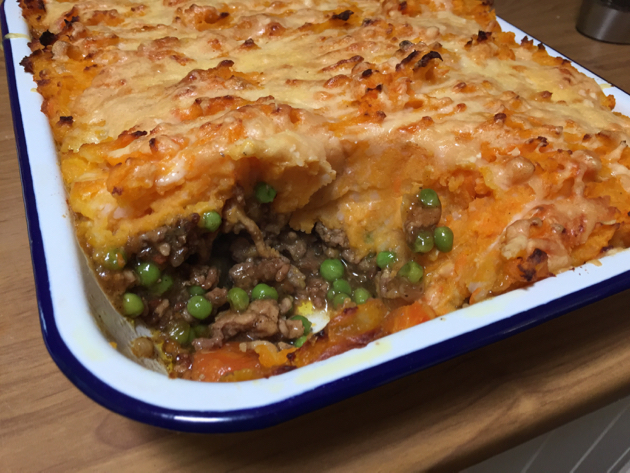 The meat pie was made using beef and pork mince, cooked till brown and with the addition of a tablespoon of curry powder, salt and pepper. That amount of curry powder adds a mild spicy taste without adding heat. I added sliced carrot, celery in small pieces, diced onion and capsicum/bell pepper and some parsley (I could easily have added more fresh herbs too). That was cooked until the vegetables started to brown and then I added a litre of chicken stock. I let that simmer for about 20 minutes, the stock reduced and right at the end of the cooking, I added a cup of frozen peas. A small amount of cornflour thickened the stock. In a separate pot I boiled three large potatoes, one sweet potato and half a small butternut pumpkin/squash. 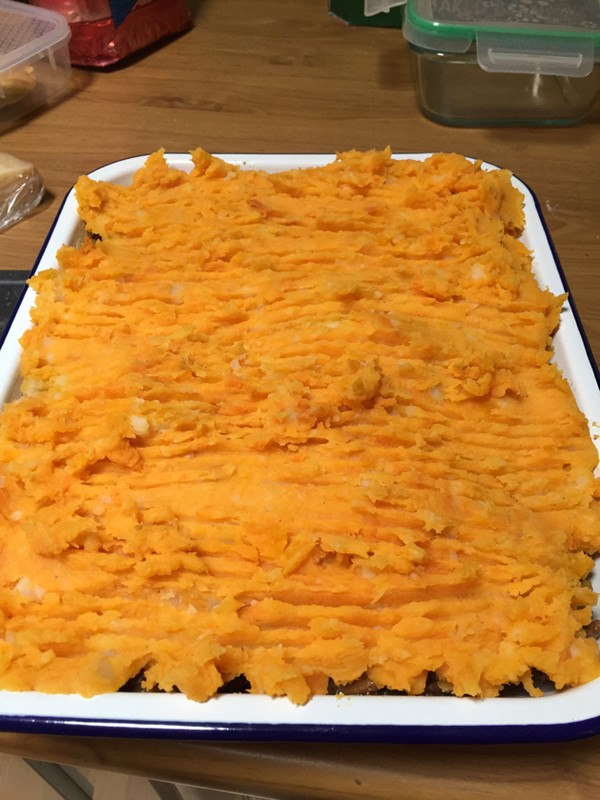 When cooked, the boiled vegetables were mashed with a little butter and added to the top of the meat in a pie dish. 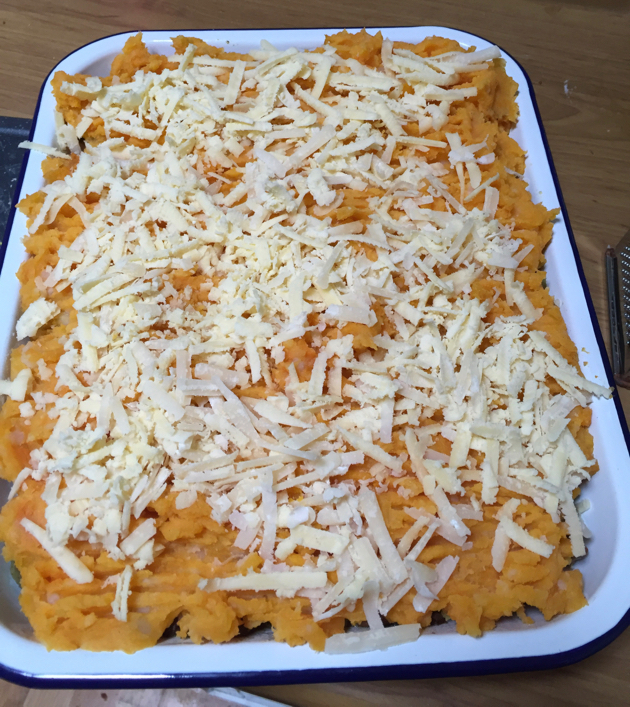 I added sharp cheddar and a small amount of parmesan because it adds flavour and makes the top crispy and golden. Omit the cheese if you're dairy-free. The vegetables you add to your pie depend entirely on what you have in the fridge however, the trio of onions, carrots and celery is the starting point for most European-style food. Start with those three, then add whatever you have. That might be one extra vegetables such as zucchini, or many extras such as garlic, turnip, silverbeet/chard, spinach, beans, kale, cabbage, corn, eggplant, or whatever. 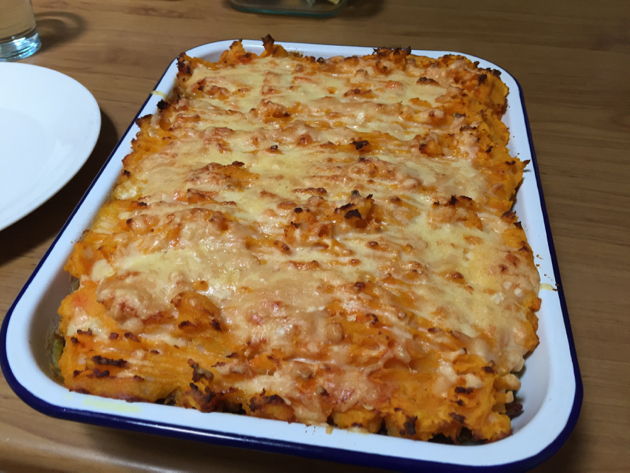 Try to stick with the topping of potatoes, sweet potato and pumpkin because it's colourful, sweetish and it goes well with the flavour of the meat and vegetable filling. If your children struggle to eat a variety to vegetables, still use all those you wish to use but instead of chopping, slicing and dicing, put the vegetables into your food processor and blitz them. That will turn them into a bit of mush but they'll still retain their nutrition and they'll be unrecognisable. They'll melt into the sauce as you cook. I spent some time this week bear watching at Katmai Nation Park in Alaska. I wish I could tell you I was there in person, but having those webcams is almost as good for this arm chair traveller. 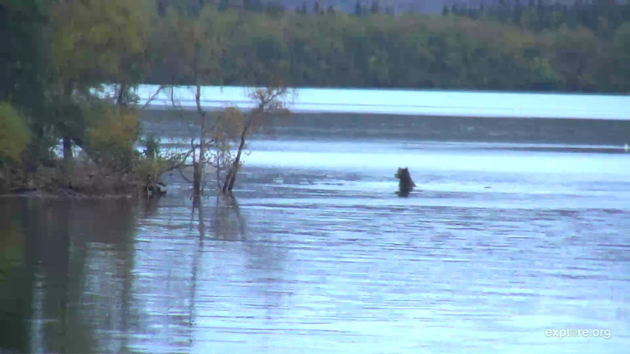 This year has seen record numbers of sockeye and silver salmon travel up the Brooks River, which attracted more bears who use the resource to help them survive a long winter. The water level was higher this year too. 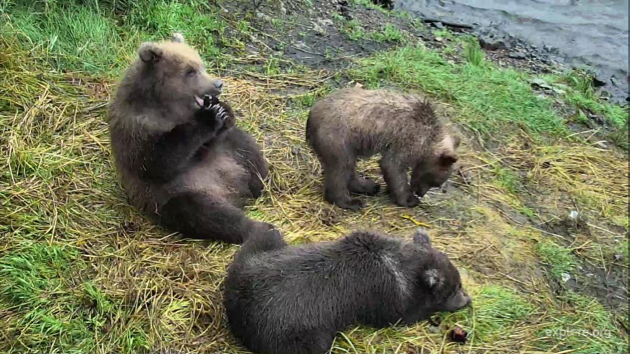 There were new adult bears seen, quite a few mothers with spring cubs and the remains one of the older bears were found near the river which had everyone speculating about what happened to him. 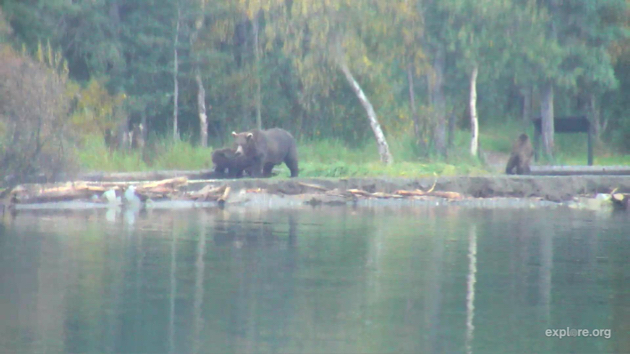 But now it's coming to a close and instead of seeing most of the bears catching fish at the falls, we're seeing them at the mouth of the river too. They scavenge around floating through the water casually catching dead and dying fish. It's natures way of cleaning up after the fish return to the place of their birth to die, completing their life cycle. I never tire of watching the unscripted, day-to-day activities of the bears play out in front of the cameras. 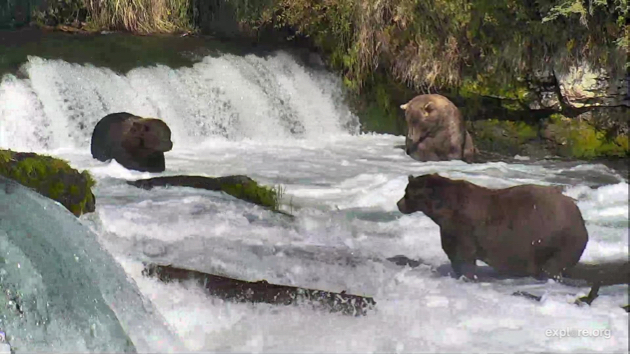 In the next month, as the weather gets colder and the bears reach their maximum weight, they'll start leaving the falls and move up to higher ground where they'll dig a new den and settle in for the winter. We'll see them again in June 2017. Thanks for your visits and comments this week. I love seeing new readers here as well as older readers who return every day (for years). Have a good weekend, friends. I'll see you next week. Heather at Beauty that Moves is having a Whole Foods Freezer Workshop starting early October. It looks like such a helpful way for new cooks, and those who need help organising food, to gain the valuable skill of freezing wholesome food. There's even a virtual classroom on Facebook but then Heather is a seasoned workshop presenter so I'm sure all avenues are covered. 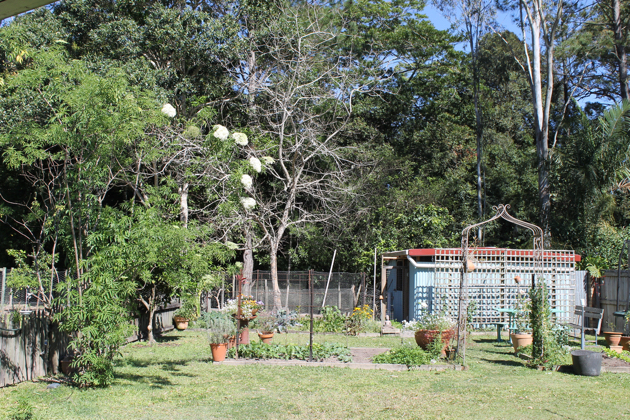 Pip Magazine, Australia's permaculture magazine, has a Down to Earth flavoured subscription offer. Look here for the offer, then check out the rest of the magazine. Luckily I don't compare my performance to what others are doing. When I look at the forum and see the amount of work some of our members do every day, I think back to when that was my day too and breathe a sigh of relief that my seasons have changed and there is less work to do. 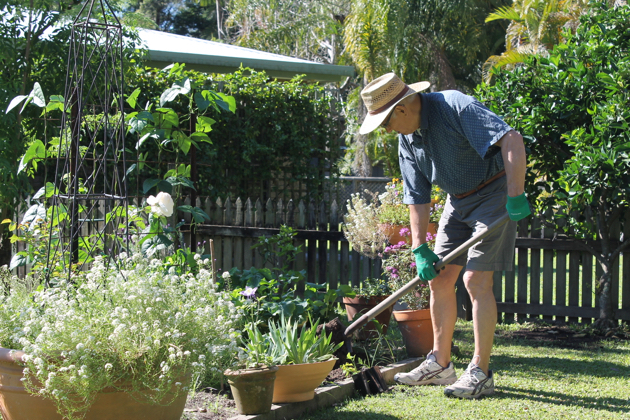 I come from a working class family who took pride in the paid and unpaid work they did. In our world, most of what we had we got through hard work. Daily work, and the importance of it, is etched into my soul. Very few of us are wealthy enough to go through life without work and to tell you the truth, if I were in that category, I'd work anyway because of the many non-financial benefits work brings with it. Work helps shape the person you become. When I closed down my business many years ago, I didn't know what I would do but knew I wasn't about to be spending time on a beach soaking up the rays. I had to realise my worker's ethos in a more creative way because I knew that daily work would always be part of what I do and who I am. As I walked away from commercial work, I wasn't sure to what extent, but I had a strong feeling that domestic work would help save me. I didn't know it at the time but the day I picked up my broom and put on my apron was the day my life changed for the better. I'm still here all these years later, working for the life I want and appreciating the power of our home while I look forward to the years ahead. So what am I doing? Many people ask me about my days and what I do so here's what I did yesterday. Got up around 3.30am, dressed and checked emails, the blog comments and the forum. Then I watched a TV program about a Russian museum that I recorded the other day. I was covered with a thick fleece and had my slippers on so I was warm, the room was fairly dark and I eventually drifted off to sleep. When the program finished, the TV and recorder turned themselves off and I slept soundly in my armchair until Hanno came out at 7am. 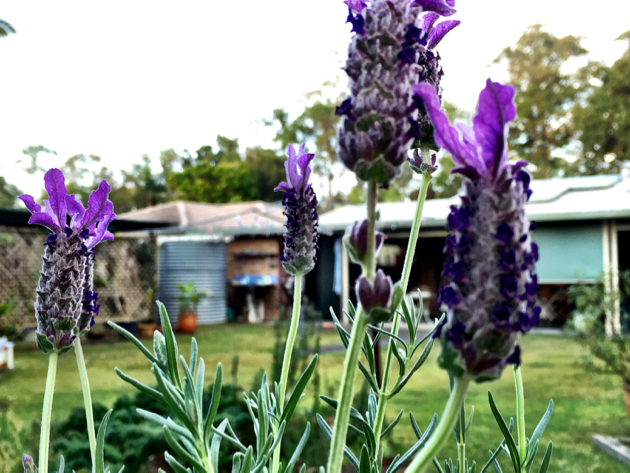 After waking up a second time, I let the chickens out for the day, put food in their hopper and lingered in the garden watching the early bees moving from flower to flower. Hanno unpacked the dishwasher while I made breakfast then I cleaned the kitchen and made up a care parcel for a friend so Hanno could post it when he went out. Tricia rang. We talked for 20 minutes or so, I made the bed, cleaned my teeth, brushed my hair and opened the windows in the bedroom and bathroom. Then I went outside again for 15 minutes to water the seedlings and the new plantings of lettuce and silver beet/chard. 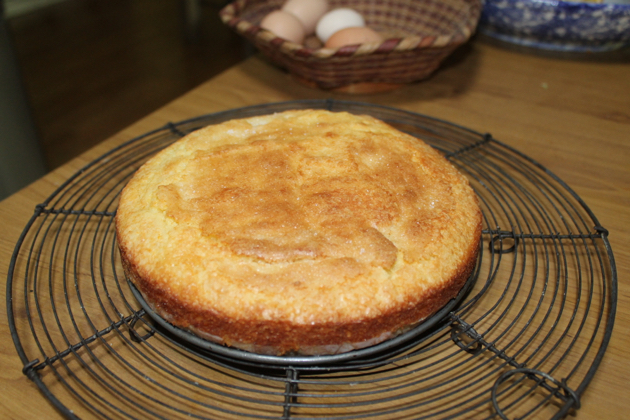 Hanno went for his blood test and to pick up a few things at Aldi and I baked a cake from the CWA Classics book - Mum's Orange Tea Cake. I've made it a few times before and it's delicious. 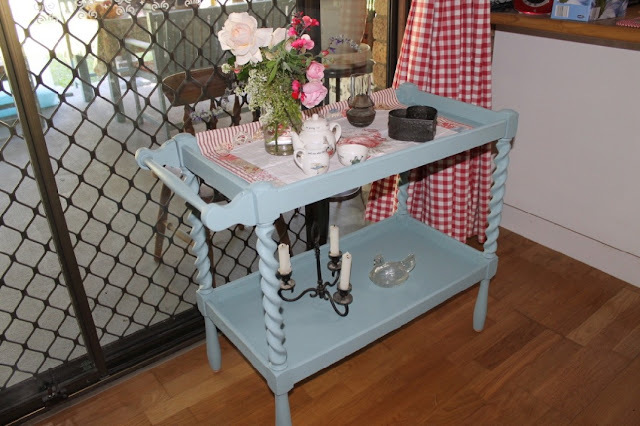 We have it over a few days for morning tea. Preheat oven to 180C. 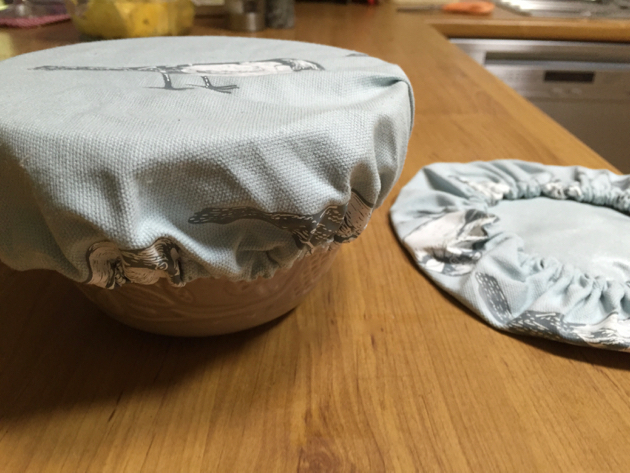 Grease a round 20 cm cake tin and line the base with baking paper. Cream butter and sugar, add the egg and beat well. Add zest and juice of orange (don't worry when it curdles). Sift in the dry ingredients and mix well. It's a thick batter but if it's too thick add a little milk. Pour into prepared tin and sprinkle with extra sugar. Bake until it smells cooked and is golden on top, about 30 minutes. After cleaning up my baking equipment, I started on lunch. We have our main meal at lunchtime now and have tea and a snack in the late afternoon. 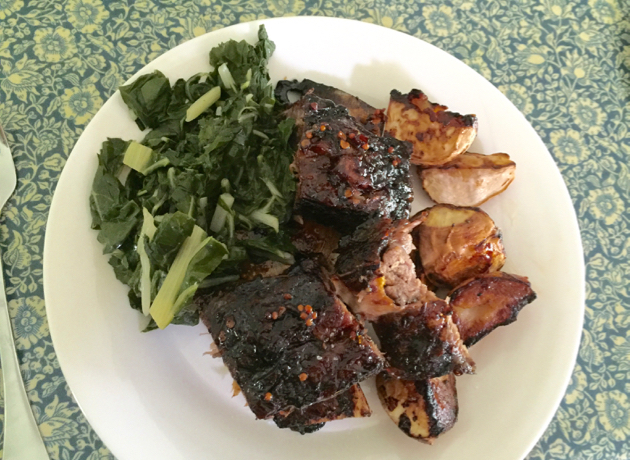 Yesterday's lunch was beef ribs with silver beet and turnips from the garden. The beef is very easy to make. I wrap it tightly in two sheets of alfoil and place it in a hot oven at 190C for about 60 minutes. That steams the ribs and when I peel back the foil the meat is starting to fall off the bone. For the remaining cooking time, leave the foil open. I make up a marinade (below) and brush it on the top and sides of the ribs and keep cooking it in the oven at 180C for another 30 minutes. A second brushing of the marinade and then let it cook for 15 minutes before removing it from the oven. Delicious! BTW, we use entree plates instead of dinner plates now so if you think the plates look crowded, it's because they're smaller. After lunch I cleaned up, checked the forum and emails and hemmed Gracie's fleece. 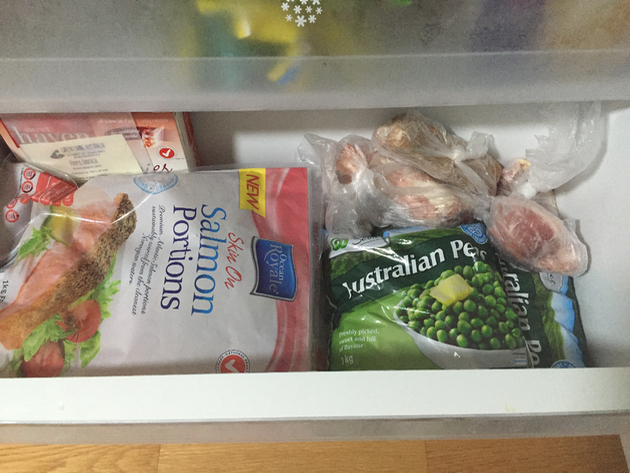 I emptied the freezer drawers at the bottom of our fridge, washed the drawers, organised the frozen food in there, and added the ice cube container for the ice I'll make soon for the warmer months. 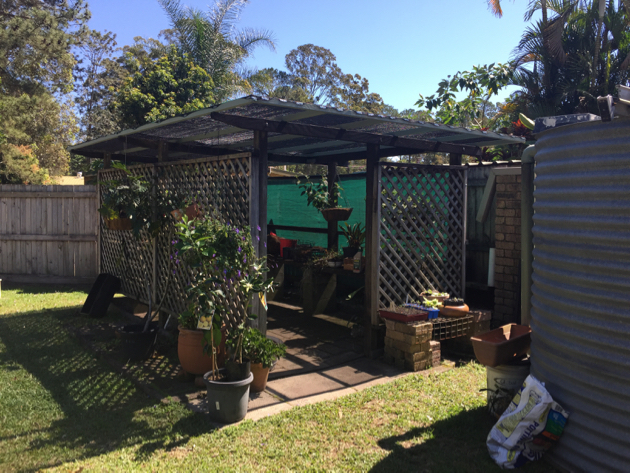 Around 3pm we pulled down the shade screens on the back verandah and had afternoon tea. Tricia phoned again and we talked and giggled about a letter she found that I wrote to her in 1962 when she was away staying with our Aunty. I wrote about Bobby Darin (the singer) and Father Knows Best (the TV show). LOL I was 14 years old. 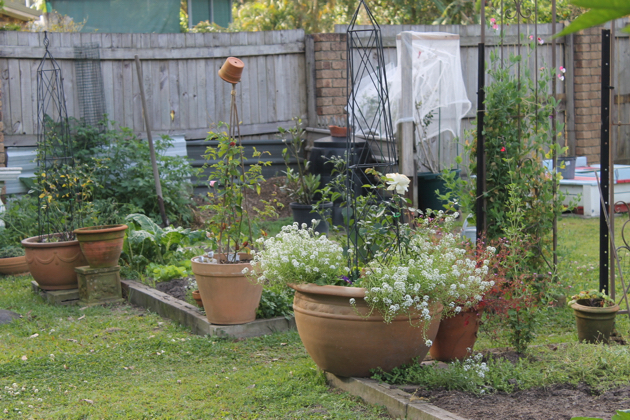 Then back outside again to water the vegetable garden which gave me the opportunity to sit and watch the birds and listen to the teenager next door express his angst with a sad song about losing his girl. Ah, teenage love. Back inside, I started writing this post and then made tea and toast which I enjoyed while watching TV for an hour with Hanno. 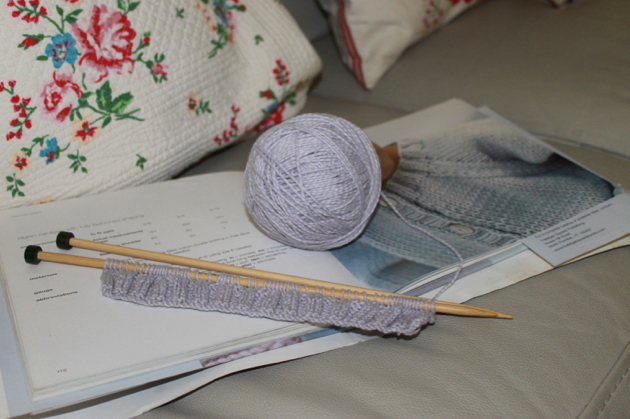 A bit of knitting was done, the kitchen cleaned up, a few notes made in my notebook and some messages and emails sent. And that was it for the day. It's only a fraction of what I once did but with older age comes less energy, calmness, contentment and the desire for self-reflection. So while I happily acknowledge that I do less work, I know there is less to do because we have pared back our wants and needs. And at the end of the day, I go to bed satisfied and while I don't catapult myself out of bed every morning like I once did, there is still a burning desire to live well and enjoy every day. 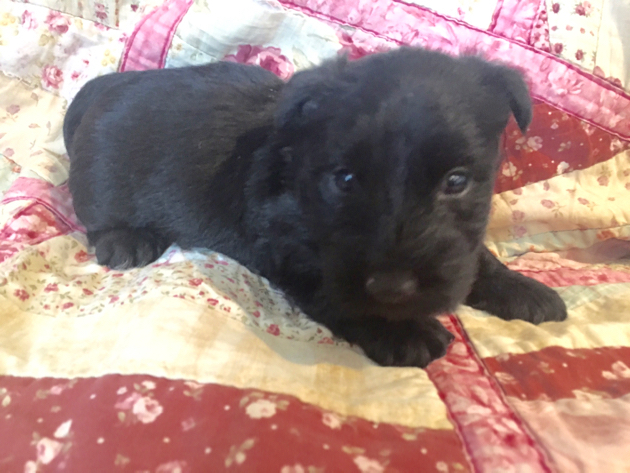 Yes, there's a new baby coming into our lives, she's a Scottish Terrier puppy called Gracie. Those of you who have been reading here for a long time will know that in the past we lived with Airedale Terriers. We lost Rosie, aged 12, eight years ago and Alice, aged 13, five years ago. When Hettie, our 18 year old cat, died last year we were both heart-broken and we swore she would be our last pet. Those final days were just too painful. Well, a bit of water has flowed under the bridge since then and life seems to have helped us forget some of that pain. All the pressure of paid work is in the past for us and now that we're up to date with our home maintenance, we're looking for new challenges. Enter Gracie, stage left. She arrives on 5 October and we're really looking forward to welcoming her into our family. We'll go back to making dog food and biscuits and having chewed shoes. Gracie will be a house dog, with occasional forays, when she's older, into the chook house to help us keep down the rat and mouse population out there. Traditionally Scottie dogs were bred to hunt rodents. There are many things we can all do to save money in our homes. Some of them are so easy and commonplace we rarely think of them, or think they'll save us money. One of these is the humble cleaning cloth - those cloths that are used in the kitchen to wash up, wipe down benches and clean up spills, as well as dusting and cleaning cloths for general household cleaning. Click here to go to a 2011 post about cloths. As you can see in that post I was cutting up an old flannel nightie to use as cleaning rags. 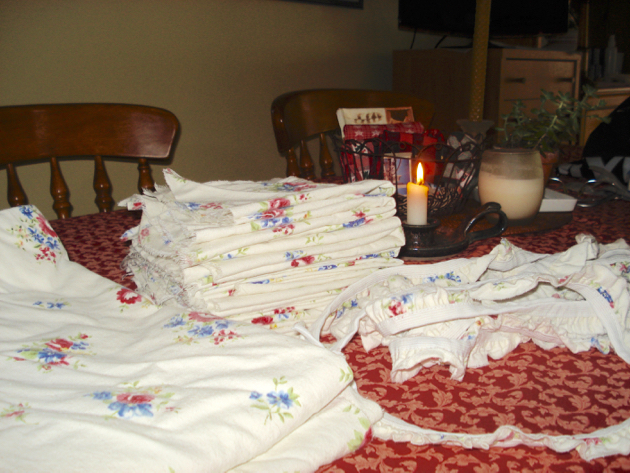 Well, I'm still at it, last week I was cutting up old tea towels and hemming them to be used as drying cloths. Cleaning is much more effective is everything is dried after it is cleaned. Here you can see that I've cut the elastic bands from the edges of an old fitted sheet and then used the fabric as super absorbent, soft cleaning cloths. In Australia the most popular brand of cleaning and washing up cloth is Chux. Way back when I gave no thought to grocery shopping or wasting money, I used to buy a packet every week. I'd use them for all the normal tasks and throw them in the bin after they'd been used a few times, or if I'd cleaned up something disgusting. Chux cost from 30 - 60 cents each now and they're used a few times and then thrown away. You could wash them in the washing machine but most people don't do that. They're marketed as "disposable" and are usually thrown out. If you were to buy one large pack a month for six dollars, you'd be spending 72 dollars a year that you don't have to spend. When I think back to those days it astounds me that I was so thoughtless. Not only about the money I used to spend but also for all the landfill I was responsible for. I'll never go back to that. Using old sheets, towels, t-shirts etc is a much wiser way to go. As long as the fabric is cotton, linen or bamboo, it will clean and dry well. When the cloths are dirty, just put them in the washing machine on a normal cycle and dry in the sun if that's possible. When they're past their useful life in the house they can go on the compost heap. 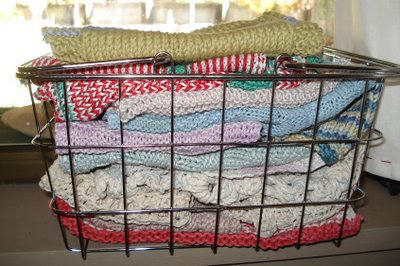 My basic cleaning cloths are knitted organic cotton dish cloths, microfibre cloths, and rags I make up from old fabric here at home. 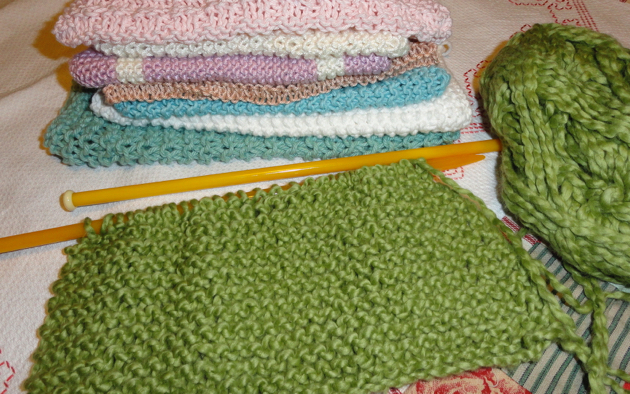 I use organic cotton yarn for the dishcloths which I get from my sponsor EcoYarns. I have six microfibre cloths that I use in the bathroom for cleaning and drying and the rest of my cleaning cloths are old fabric that's been recycled. 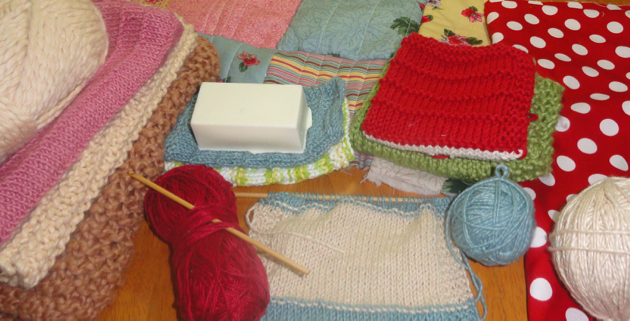 If you build up a stockpile of dishcloths, you'll have enough on hand for all the cleaning you need to do. 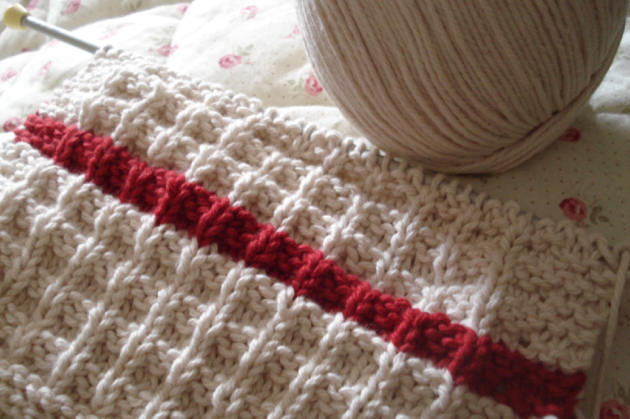 When you've made up a few dishcloths, if you've used a good quality cotton they can be used as face cloths as well. By teaming a few cloths with a bar of home made soap, it makes a lovely gift for a birthday or at Christmas. 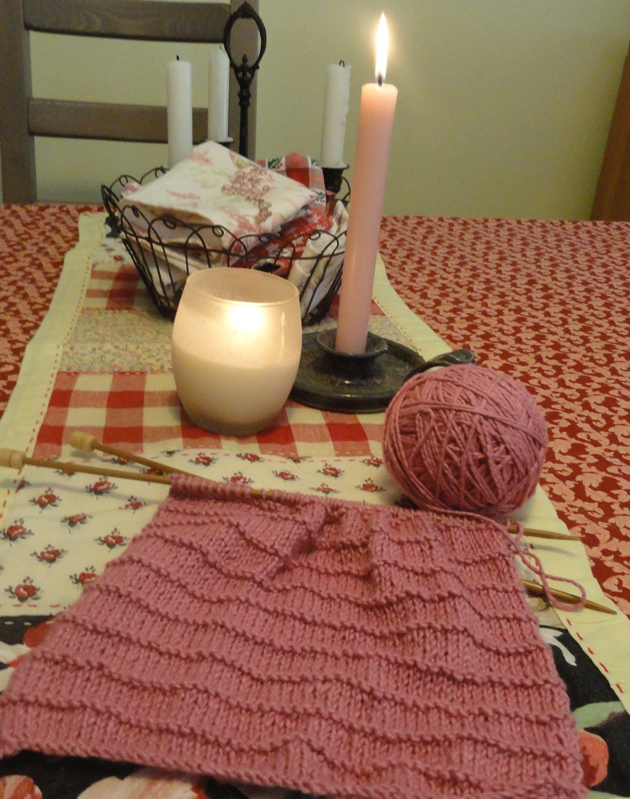 The cloth I knitted above is using Debbie's fabulous waffle weave pattern. You can find the original pattern here on her blog. 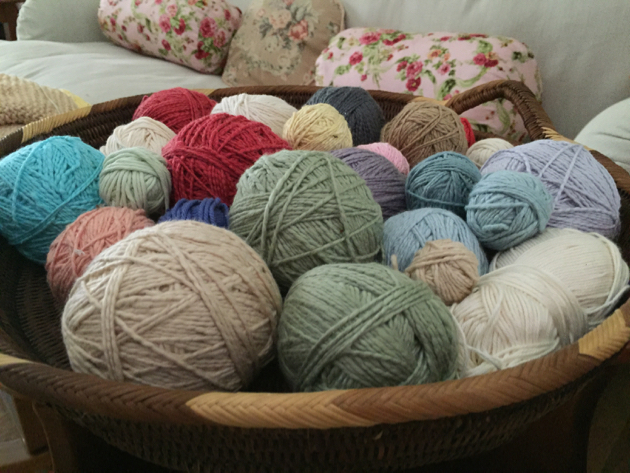 When you have a good supply of knitted dishcloths, store them in a little basket or a kitchen drawer so you can just grab one whenever it's needed. It's so easy to recycle your old sheets and towels. Simply cut them to the size you need - I tend to prefer larger rags of about 40 x 40cm (15 x 15 inches). If they're for general cleaning you don't need to hem them unless they're dropping a lot of threads. I used to use pinking shears to cut the edges but now I just rip them, it's faster. And the easiest place to store them is in a rag bag. 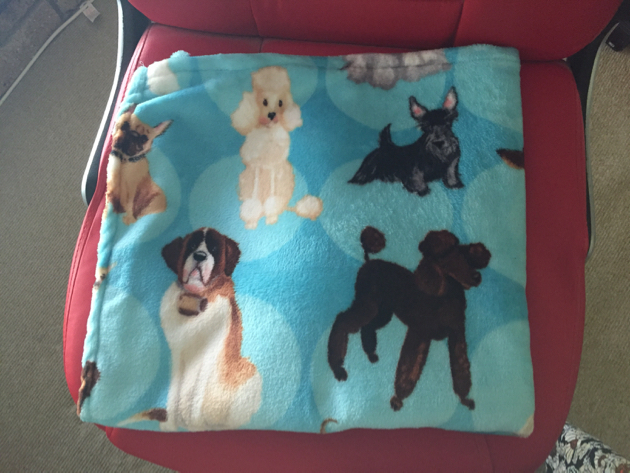 I made one for myself and have it having in the laundry. I throw out rags if I've wiped up something really nasty, if I've just done regular cleaning with them, I rinse them out then wash them in the washing machine along with my normal washing. They're hung on the line to dry, folded and stored in the rag bag. Above is the rag bag I made years ago to store my rags in. 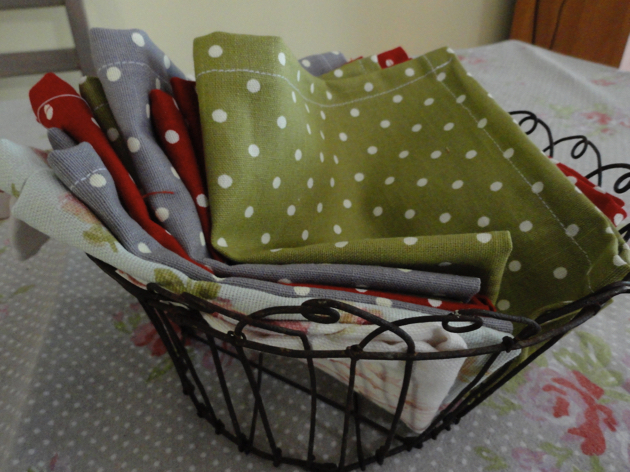 It doesn't take much to start making your own cleaning cloths and dish cloths. 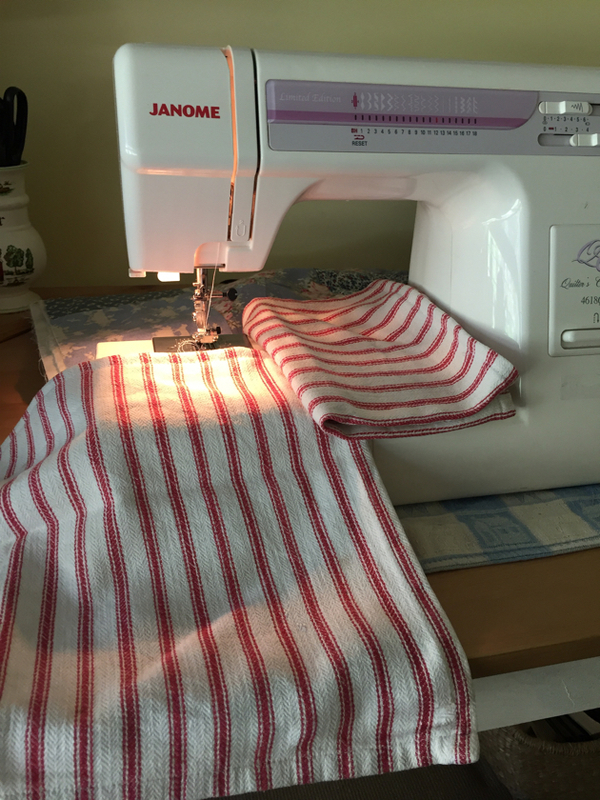 Just make the decision to do it and when you have a ripped sheet that can't be repaired, old towels or tea towels, put them aside instead of discarding them. 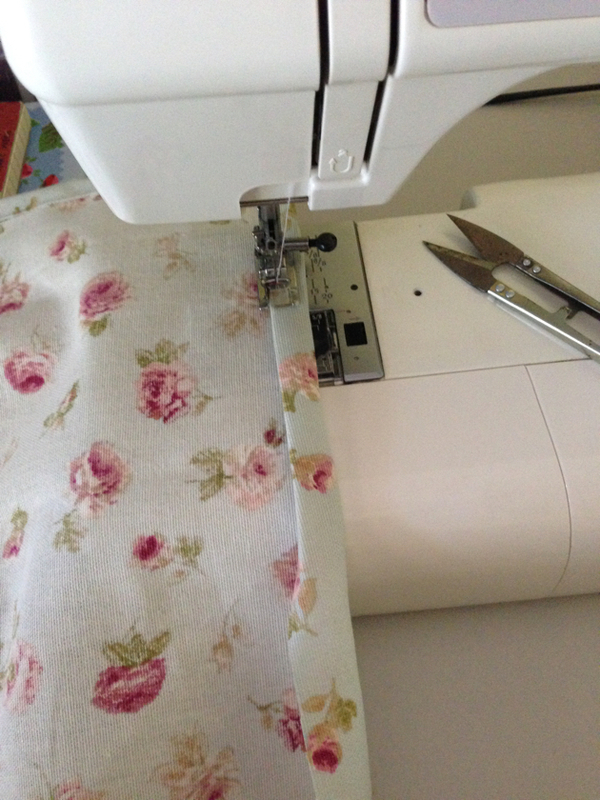 When you have time, work out the cloth size you prefer and then start cutting or ripping. 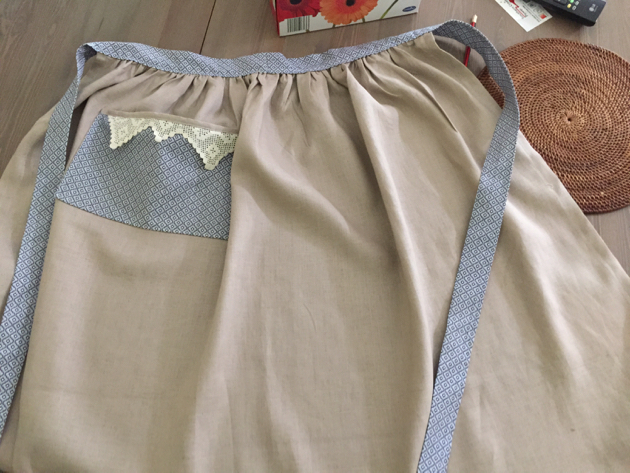 I think I included a rag bag pattern in The Simple Home. 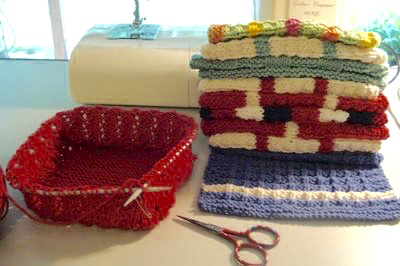 If you're making dishcloths, I added the waffle weave pattern in the Down to Earth book, there is another pattern here in an older post, and here is a collection of numerous dishcloth patterns. It's so easy to do, you'll be doing something positive and a practical expression of your sustainable values. But that's just the start of what you can do to lighten your footprint and cut your costs while still having a wide variety of good quality household linens in your home. 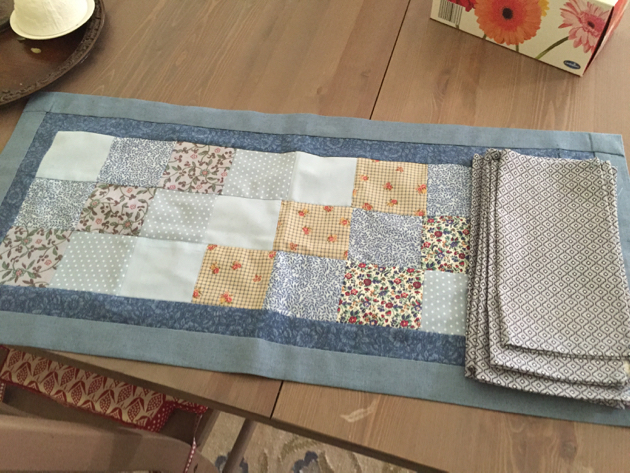 You can make table cloths from scraps of cotton, if you have no sink drainer, make a terry towelling mat to place under your dish rack. 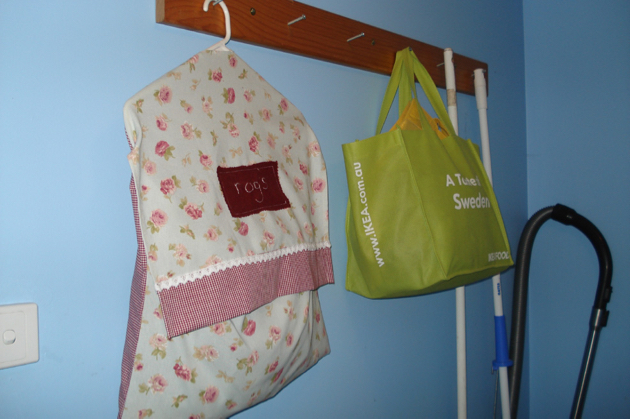 Aprons help protect your clothing when you're working at home and also make a great gift. 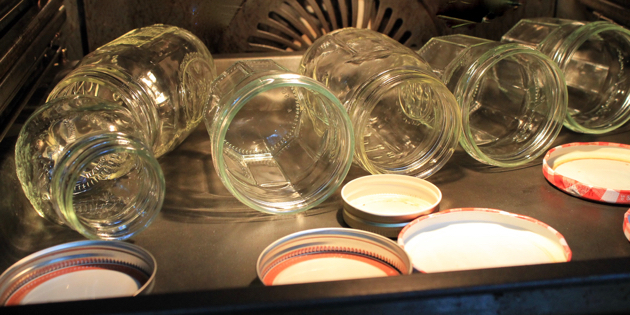 There are table runners, napkins, tea towels, jug covers and cloths to cover your fermenting jars and bowls. The list is long, my friends, and most of these items are things that were one common in every home and now are difficult to buy in a shop because people don't use them as much. 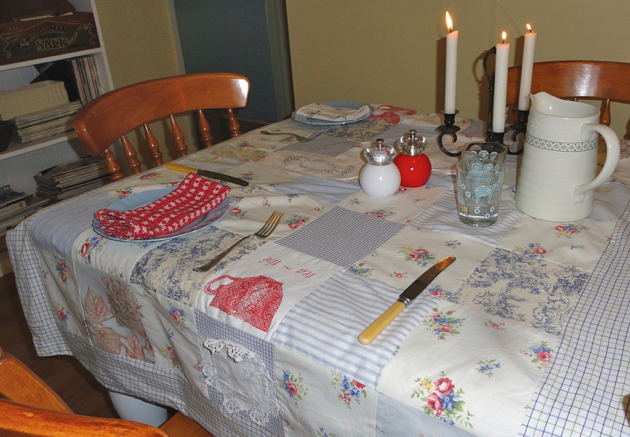 A patchwork tablecloth made from old tea towels, doilies, sheets and pieces of fabric. 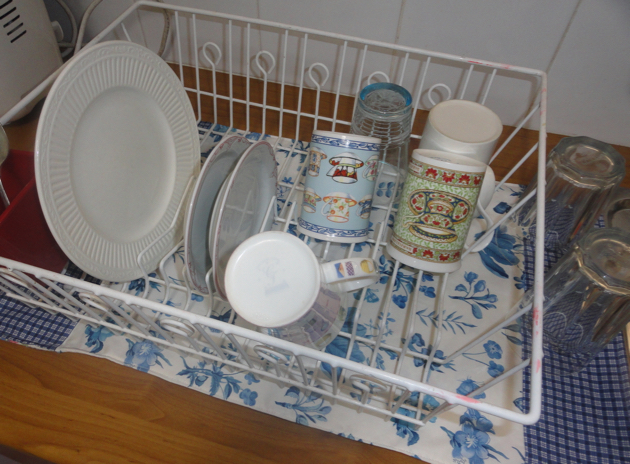 This dish mat will help catch the drops under a dish rack. It's cotton on top and terry towelling underneath. The bowl covers above are shop-bought and given to me as a gift but you could easily make your own and start cutting down on plastic wrap. Aprons, table runners and napkins are all easy to make and will also serve as useful gifts. 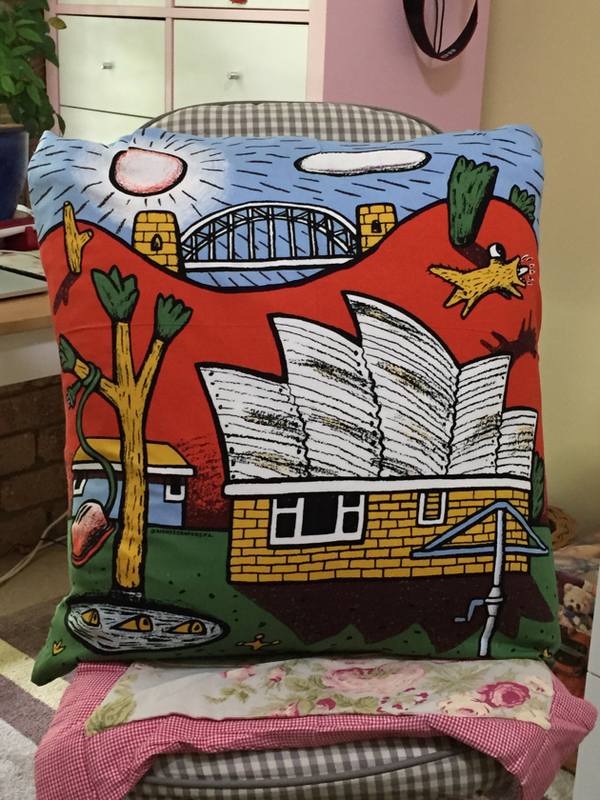 The cushion cover above used to be a Mambo shirt. I made it into a cover and gave it to my son. He loves it. 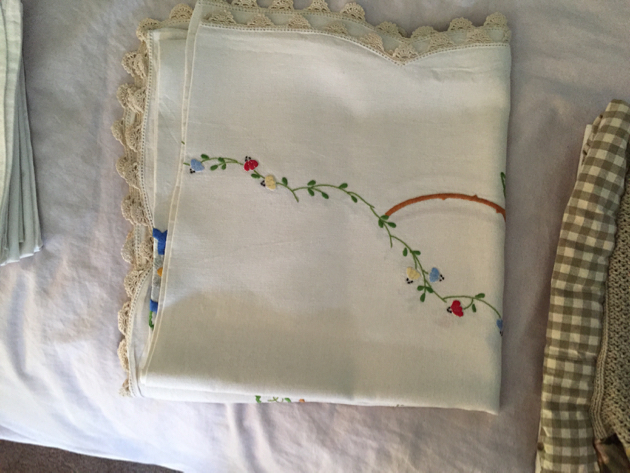 Making your own table napkins will allow you to stop buying "disposable" napkins and have a selection of lovely cloth napkins on the kitchen table. They just need to be cut to the required size and then hemmed. Above and below are my latest recycling efforts. 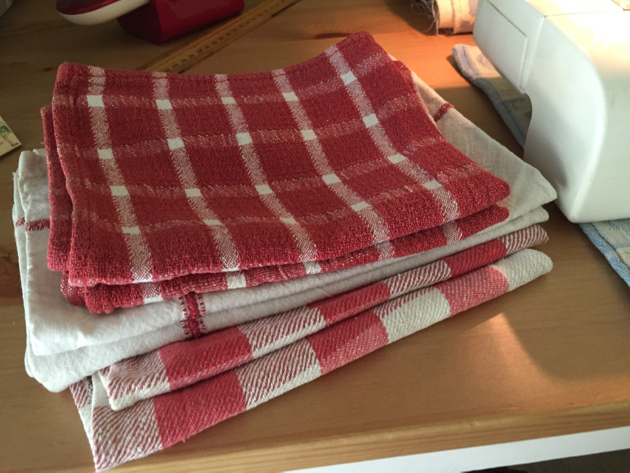 I have too many old tea towels so I took out the red and white ones, cut them in two, hemmed them. Now they are used to dry the kitchen sink, benches, windows and appliances after they've been cleaned. This is all simple sewing and knitting that anyone can do. Let's stop wasting resources and money buying the convenience of Chux and get back to being productive in our homes. It's easy to do, it often helps you recycle instead of discard, it costs less and it means more. A lot more. My thanks to everyone who shared their thoughts on topics to write about. It was quite overwhelming reading such heartfelt comments. I also received over 50 emails from readers who explained what they get from the blog, how it's helped them over the years and what they'd like to read in the future. I cannot reply to all of those emails but I am grateful that so many of you took the time to explain what the blog means to you. Having all those opinions and suggestions allowed me to focus on what I want to write now. I started the blog because I'd written the beginnings of a book that no one wanted to publish, so I used those chapters as posts. The blog has been a platform from which to share ideas, a way to encourage change, a continuing record of my home life and sometimes, a confessional and a way to test my own thoughts. It's been a rollercoaster, that's for sure. This blog made me a Penguin author, gave me a lot of self satisfaction and helped me earn a small amount of money while tapping away on a key board in my sewing room. I loved that as an older woman I was given a platform and that so many people listened, believed and saw a reason to change. I'm still not really sure what I want the blog to be in the future but I know what I don't want. I don't want to write to a pre-determined formula, I want to surprise you. I want to surprise myself! I'm nearing 70 and in May next year this blog will be 10 years old with close to 3000 posts. I imagine I'll keep writing on a semi-regular basis for a few years, explaining what I do at home, especially those things that have changed over the years. I'll also write about ageing. That's something we should all be interested in because we're all doing it. If we only listen to the voices in magazines and on social media, we'll all feel like failures. There needs to be a balanced view. I feel quite privileged to be growing older because that means I haven't died before my time and I get to examine and digest what growing old feels like. I can't say I enjoy every part of ageing but I'm sure that it's much better than the alternative - death. I hope to have a post ready tomorrow. It will be about that most domestic of topics - rags and cleaning cloths. So if you want an antidote to mainstream life and want to read about the basics, come back tomorrow and we'll continue the story. My sincere thanks to everyone who commented or emailed about topics I could cover in future posts. It really clarified things for me and I've been giving it a lot of thought as I go about my work. I'll explain it all in Monday's post so tune in then. I hope you have a wonderful weekend and get the chance to either relax or do something you really love. See you next week, friends.